With plan or with specifications, we create all types of beams, either simple or with strong added value, and based of any types of thread and cable. 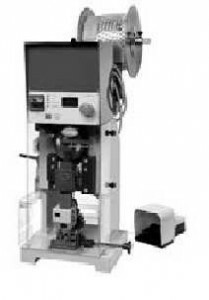 To automatize operations and optimize costs, we provide our KOMAX Gamma and STOCKO machines. They follow operations of cut, stripping, tinning, and crimping. Our additional automatcic machines allow us to respond to your specific needs: pneumatic clips, BOWE twisting machines, electronic and pneumatic presses, as well as a SCHLEUNIGER Powerstrip multi-level stripping automaton. For manual operations, we offer our knowledge and skills acquired for many years. Our services are reactive, diligent, and we make a point of providing an irreproachable quality of work. SCAITA offers card, connectors or beam potting services, principally thanks to a specific BARTEC machine. The latter precisely creates a mix or resin and hardener to resin an electronic card in an electric box. Copyright © 2019 Scaita (english). Powered by WordPress. Theme: Spacious by ThemeGrill.